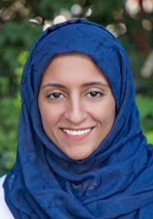 Dr. Doaa Aljefri is the Antimicrobial Stewardship Pharmacy Fellow at Northwestern Memorial Hospital. Dr. Aljefri graduated from University of King Abdulaziz in Jeddah, Saudi Arabia and moved to the United States to pursue a higher level education of Clinical pharmacy. She pursued Masters degree in Regulatory Affairs and Health Policy from Massachusetts College of Pharmacy and Health Science University. Upon completion of her Masters, she completed a PGY1 in Beth Israel Deaconess Medical Center. Dr. Aljefri is very passionate about building a robust Antimicrobial Stewardship program when she returns to her practice site at Saudi Arabia upon completion of her fellowship. Outside of work, she enjoy horse riding, reading and spending time with family and friends.